As you know, grinding your coffee is essential for making a good espresso. I started with a Porlex that I later replaced with the Kinu M47 (which I did the review here). Then I decided to replace Kinu M47 with the latest high quality manual coffee grinder: the “Apollo coffee grinder” (manufactured by BPlus, with the appreciation and permission of La Pavoni). Why ? because the coffee grinder Apollo solves some problems that displeased me, after a longue use, with the Kinu M47. It is made entirely of metal: the body of the mill is in CNC anodized Aluminum, everything inside is stainless steel, the only rubber element is a non-slip placed under the base. The 48 mm conical burrs are manufactured by the italian Italmill (Nanotech Coating). Burrs are standard stock by Italmill. It will be easy to replace if needed and are guaranteed for 100k shots. The mill is available in three colors: gold champagne, silver and matt black. It has a total weight of 1030g and grinds up to 25g of coffee beans. According to my tests, I grind 13g of coffee in 40 cranks. That is to say that I put between 15 and 20 seconds to grind the coffee necessary for an espresso. For a coffee grinder of this category, it has a rather attractive price : 222 €. It was delivered to me in a week and I did not have any customs fees. Design is important for me. Expensive products that, in addition to grinding the coffee, must give a certain pleasure to look at and using them. The Apollo coffee grinder is available in three colors: matt black, gray and gold. It really looks like the columns of the “Basilica Santissima Annunziata del Vastato”, a monument in the style “Mannerism” that is in Italy. This design seems to honor the Italian origins of the burrs brand. In addition, this shape greatly improves the grip of the coffee grinder during use. Since the body of the mill is cylindrical, when grinding coffee, it must be able to hold it should prevent turning on itself. Almost all the coffee grinders on the market are simple smooth rolls. This is binding: you have to squeeze very hard to prevent them from slipping. I had the expense with my first manual mill: the Porlex. For instance, the Kinu M47 has been designed with a small wedge for the thumb to avoid the rotation of the mill. After several months of use I can say that this approach is not optimal because it requires always the same finger (thumb) to hold it firmly to prevent it slips. To be really effective, it would be necessary to be able to block the mill with all the fingers. Apollo coffee grinder body. Diameter slightly larger than the Kinu M47, it is easier to handle and maintain. For the Apollo coffee grinder, with its “honeycomb” shape (which is an integral part of the design), the palm of the hand and the fingers adhere perfectly to the mill. It is not necessary to squeeze very hard, which makes it more pleasant to use. By its shape I think we better hold the handle of the Apollo than the Kinu M47. As you can see in the photos, it is bigger and rounder. When I use a coffee grinder, I always place the palm of my hand on the top of the handle. The crank Kinu is a little narrower and does not have the roundness of the palm of the hand when it is tightened. The Kinu handle is not unpleasant, but it is less comfortable than the Apollo coffee grinder. To my knowledge, there are only two mills that meet the second category: the kinu M47 and the Apollo. In my opinion, there is one detail that has been better thought of with the Apollo coffee grinder. It has an angle of attack of the funnel which is more pronounced compared to that of Kinu M47. During daily use, this detail is not anecdotal and is important because, it allows you to pour the coffee at once without grains bouncing on the edges (of the funnel) and end up on the ground. In addition, the opening of the cylinder is a little more important at the Apollo mill reducing the chances of loss of coffee. The setting of the grind of the Apollo and Kinu M47 is not stepless but is done click by click. Like many grinders that work by this mechanism, it is very very accurate (see below for more details). Although visually similar, the mechanisms of Kinu M47 and Apollo are totally different. On the Apollo coffee grinder it is possible to turn the adjustment wheel without having to loosen the screw that holds the crank (of course, the adjustment knob does not jump when using the grinder). This is not possible with the Kinu M47: you must loosen the screw first (which holds the crank) and then adjust the coffee grinder coarseness. More, on the Apollo, it is not necessary to tighten very much the screw that holds the set. The setting will never jump. By cons with the Kinu M47, I often had the bad surprise to see my setting jump one or two notches when using it. Elements of the mechanics for the Kinu M47 and the Apollo. These are the elements that keep the crank in place and adjust the grain of the grind. The container of the Apollo coffee grinder is screwed while that of Kinu M47 is fixed with magnets. Both systems are effective. Personally I have a small preference for the magnetic fastening system even if the screw system may look much stronger over time. You will notice in passing that the base of the Apollo coffee grinder is wider than the Kinu M47. This accentuates its foundation. The Apollo mill has a great advantage over its competitor: it can be disassembled entirely and reassembled without losing the settings. The complete cleaning will be all the easier. Although complete disassembly of Kinu M47 is possible, it is strongly discouraged. As you can see, you have to go with hammers, at the risk of damaging the coffee grinder. Moreover, when reassembling it is impossible to find the initial setting. Here we go again on several tests to find the good fineness of the grind. The maker of Kinu M47 says on his site that his grinder can be disassembled without tools in 1 minute. The only problem is that we do not disassemble the entire mill (we remove only the central rod does not allow access to the inside of the coffee grinder for cleaning). With the Apollo coffee grinder, after removing the central rod, we dismantle all the remaining parts by removing two small screws. We can then remove the second part of the wheel and one of the two ball bearings. As a result, it is very easy to clean the interior of the mill and reassemble it, without loss of adjustment. 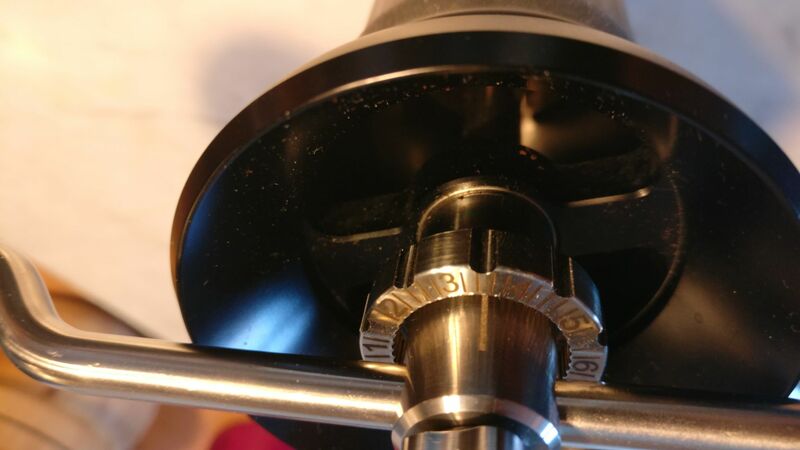 With the Apollo coffee grinder, the first step is to remove the central stem. He then removed the ball bearing. This completely frees access to the mill body to clean it properly. After going up the mill, we find the original settings. Detail of the ball bearing of the Apollo. It is maintained (with the fixed part of the grinding wheel) using two screws. The whole is solid, does not move is easy to disassemble and reassemble). In addition, we find the settings after dismounting and reassembled. Ensemble des éléments qui constituent ce moulin à café. Cleaning the interior of the Apollo is very easy once we have removed the wheel and the ball bearing by unscrewing two screws. The inside of the Kinu M47 is difficult to access unless we remove the wheel and ball bearing with a hammer (which is not recommended). To grind 13 grams of coffee with the Apollo coffee grinder, I do about 40 crank turns. That is to say that I put 15 to 20 seconds to grind the coffee (18 seconds on average after being timed 3 times). Note that the setting is a fine molding compatible with an espresso machine. In the demonstration video of the Apollo coffee grinder, the operator takes about 25 seconds to grind 15 grams of coffee. As I do not keep the mill on the table when I grind by rotating both the coffee grinder body and the crank, I’m a little faster. The retention of coffee is extremely low on manual coffee grinders (compared to electric coffee grinders that can sometimes hold several grams of coffee). Generally I put one or two drops of water in the coffee before grinding it to neutralize the static electricity responsible for the retention. I observed that coffee tends to stick a little more in the container of Kinu M47. This forces me to kick on the side of the containers to loosen the rest of the coffee. I have the Apollo for less time but I sincerely feel that it is less the case. In my opinion, the Apollo and the Kinu M47 are quite equivalent in terms of the quality of the grind. They both make excellent espresso (and even use a bottomless filter holder). The Apollo is a very good coffee grinder. It is beautiful, very functional, with a very good grip, the ability to disassemble fully, easily, finding its settings. It grinds coffee quickly. The defects that I have seen with the Kinu M47, are largely corrected with the Apollo. In addition it costs less: 222 € against vs 329 € for the Kinu M47. There is therefore a difference of just over 100 € between the two products which is not negligible. If like me you find it to your taste, do not hesitate. First, thank you very much for your wonderful detailed comparison review! I enjoyed reading every word. ? I have a question in the burr rub. Can you lock the burrs on Apollo? In recent iterations of M47’s, you can’t lock the burrs with the tightest setting from the threads on the adjustment knob. If you can with Apollo, how early is the burr rub gone? Full rotation of the adjustment dial? Half a turn? Quarter of a turn? I want to have an idea how aligned it is. My M47 v3 is notoriously aligned that it has no burr rub even when the setting you’re on almost don’t let any coffee out when you try to grind. Hi, maybe I can share what I have on my Apollo grinder. Yes, the burrs will lock up as you turn the knob till the finest. This is our zero to begin dialing. The indicator on the dial may not be at “zero” in this case. I just count from this point as I turn coarser for my grinds. Hope this information helps. thank you for the review of the Apollo grinder. Did you buy it directly in Asia? And got it shipped to your home country? Have you heard of any rumours that Pavoni might be willing to sell it in Europe? Yes, I bought it directly in Asia (on the website of the contructor that I gave in the article). It was shipped from Taiwan and arrived in France in 7 to 10 days (I do not remember). There is a traceability of the package. No, I have not heard rumors that the Apollo coffee grinder would be sold directly in Europe. Do not hesitate if you have more. Thank you for your review of the Apollo grinder. I searched for the website of the Taiwanese manufacturer to order for one but I cannot find it on the Internet. Would you be so kind to e-mail me the correct website where I can purchase the Apollo grinder? Thanks in advance for your kind cooperation. Just want to say thank you for such detailed comparison. There is nothing written about the apollo yet as it just came out, so it’s nice to see such depth of it. I am confident in purchasing, thanks to this! I was wondering though what your thoughts were on the threading for the bottom. I read it is small fine threading and doesn’t catch properly that easily, so I am worried that it might not stand up to daily use for many years. If the thread gets worn out then the unit will not be able to be repaired as its part of the main body. Also you didn’t talk about the type of coating very much. What type is it exactly, will it wear off with use? ThX! you ask an excellent question. indeed, I have the same fears as you. For the moment everything is well. however, maybe one day I’ll break it that way. I think the builder should put a thicker thread. I agree too on the fine threading. However, one good way to overcome it is to take note of the BPLUS logo below against the orientation of the main body of the grinder. There is a certain angle it will fit in nicely and allow you to screw them together just fine. I hope this helps. Yes, but I think a thinner threads, as on the “C40” would be look more solid. however, I did not have a problem and the container screwed very easily on the Apollo ???. Maybe I missed this info but what’s the difference in speed as compared to Kinu? You only posted the speed info for the Apollo. I forgot to put the information for Kinu. I put about 5 seconds more to grind the coffee with the kinu m47. currently i am changing the kinu m47 so i do not use it much. Did you get paid/sponsored/compensated/incentives to review or talk about the Apollo? Just wondering, as there are not too many reviews yet about this product since it is new to market. it is a legitimate question. no i have not been sponsored to write this article. I wrote the article by being as honest as possible. the Apollo coffee grinder is very young compared to Kinu. that’s why reviews of the Apollo are rare. Can you contact the maker and express interest in a smaller version? This would be too large for my wife to grind with her smaller hands. What coffee grinder are you talking about? kinu or Apollo ? I am referring to the Apollo. 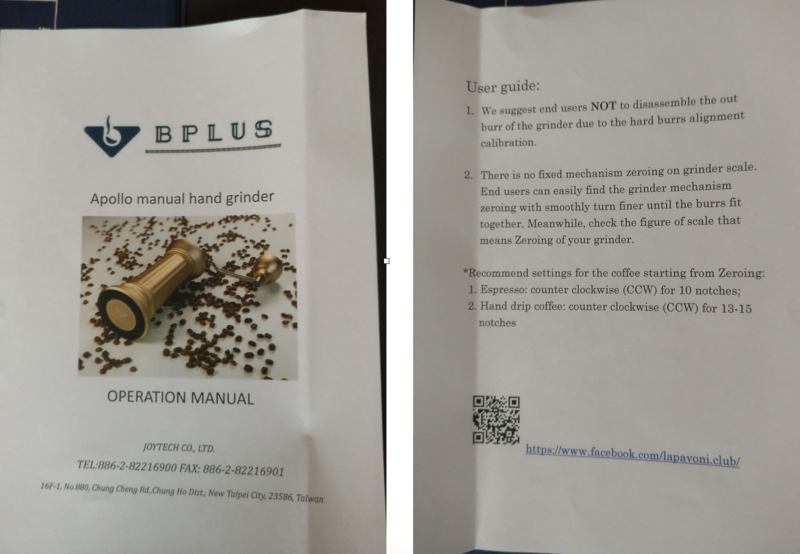 unfortunately, it is the only coffee grinder manufactured by BPlus. They do not have a miniature version (for the moment). however, even with small hands it is pleasant to use. My little sister who has smaller hands than me gets there. Still, if you want a thinner coffee grinder than the Apollo or the Kinu, there are other manufacturers the premium hand coffee grinders. I forget to mention a information. A smaller coffee grinder use a smaller Burr. So with smaller coffee grinder you need more time to grind the coffee. Thx Thomas. The Apollo is beautiful and functional. I do hope a “mini” version is considered for the female market. What type of coffee machine do you have ? Because if you use filter machine or French press, maybe you can search other type of coffee grinder ? I have received the Apollo grinder today. What you forgot to mention in the review and in the video is that Bplus suggest users NOT to disassemble the out burr of the grinder because it will lose the calibration. It is written in the user guide. By the way, which setting are you using for Espresso (how many notches from zero)? I am surprised at your comment because we can dismantle the entire Apollo coffee grinder without losing the calibration. It is the Kinu that loses the calibration when it is completely disassembled. The only thing is to pay attention to the alignment. The counter clockwise settings are not affected by disassembly of the coffee grinder. Here is a video of the manufacturer showing how to disassemble and clean the coffee grinder. For the setting, I stop 2 clicks after position 3 for 14 g of coffee. I love this quality too. hello Thomas,nice comparison! I have a porlex grinder for my daily espresso,i am interesting to upgrade my grinder…apollo worth it? Is a significant taste difference between porlex and apollo or i should purchase a compak k3? For some reason,i prefer manual grinder because i think is more reliable! My english is weak! Moving from a Porlex coffee grinder to a prenium coffee grinder is worth it. Personally, I use a hand-held coffee grinder (the Apollo) and an electric grinder (the cute Eureka). If I compare the hand-held coffee grinder and the electric coffee grinder I own, the hand-coffee grinder is more accurate. I do not know compak k3. However, what can I advise you if you hesitate between a hand-held coffee grinder and an electric coffee grinder, ask yourself how you will use them? I mean, if you are a family of 3 or 4 people who regularly coffee together, the electric coffee grinder is more interesting. If you are the only one who drinks coffee and you like to take the time to prepare it, I recommend the manual coffee grinder. Do not hesitate if you have other questions :)? Hi Thomas, have you done the particle analysis? If so, have you compared Apollo to the others in terms of particle size distribution? I only compared the Apollo and the Kinu M47 (because I bought them). I did not compare the Apollo to other coffee grinders. regarding coffee grinding, the Apollo and Kinu m47 are both excellent. I used the kinu m47 for 10 months before selling it and the Apollo I have since July 2018. And really, regarding the coffee grind, there is no difference, the kinu and the Apollo make a difference. very good work. They are both very well aligned. The difference between Kinu and Apollo is the pleasure of use. I’m sorry I don’t know. Maybe you can send email to BPlus ? Thank you for this incredible posting about the Apollo hand grinder. My only issue is that I do not like logos. Is there a way to order this grinder without the “La Pavoni” logo? Have you compared the Apollo to other hand grinders? For example, the Rosco mill by Portaspresso? There are other hand grinders as well that I’m not aware of that I would love to see compete with this Apollo. Again, thank you. What is your recommended manual grinders for french press? Hi guys in terms of burr material that is used which do you think is better , Apollo,Kinum47 or comandante? I test the kinu m47 and the Apollo. I don’t test the commandante.